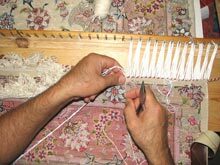 Most rugs have white cotton fringe tassels, and others have wool or silk tassels (depending on where and when they were woven). 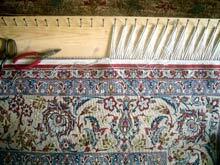 Some rug owners like the look of the fringe on their rugs, to others it drives them nuts to always be straightening them, or keeping them from getting caught in the vacuum cleaner (that’s why you vacuum from side to side instead of from end to end). 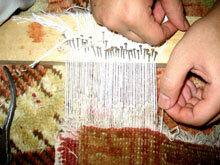 The fringe is not just a “pretty” way to finish the rug – it is actually the foundation fibers of the rug. The rug’s “skeleton.” Each individual tassel that you grab in your hand runs through the middle of the rug all the way to the other end, emerging as another individual tassel on the opposite end. The fringe is the first thing to go on a rug. It’s inevitable. Years of footsteps on individual tassels cause abrasion. Vacuum cleaners cause damage. And they both contribute to tearing, fraying, and an eventual wearing down of the tassels. 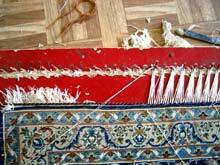 Most of the time we want our rugs “fixed” with new fringe because it just looks bad when the original fringe is worn. It’s a noticeable thing to fix, and it is the most common repair that comes through our doors. 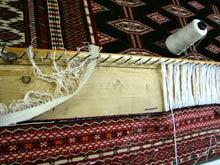 First the end must be secured with an overcast stitch so that the structure of the rug is sound. 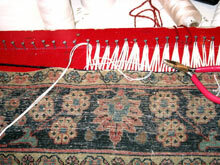 Then a new prefabricated fringe can be laid along the top of the original fringe base, and attached by hand. 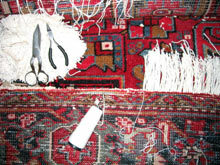 Because the fringe is laid on top of the original fringe base (the original tassels are trimmed shorter so that they do not “peek” through the new tassels) it protects the end of the rug from further foot traffic abrasion. Now the “new” fringe takes all of the abuse from footsteps.